Active Membership is open to all individuals who reside, work, or have taxpayer status in Falmouth, and to all organized groups with offices in Falmouth such as schools, hospitals, government agencies, fraternal groups, in addition to social service, arts, environmental, science, religious, political, business, and other organizations. * $30 for Individual Membership. * $75 for Organizational Membership which includes the yearly dues for one person. * $15 for each additional person under an Organizational Membership. Click here for our Membership Application form. 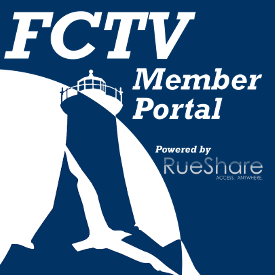 FCTV's booklet, Operating Rules and Regulations (PDF), describes membership eligibility and privileges, scheduling and access, and use of studio and field equipment. Current workshop schedules are also posted at the station. Every Wednesday, a twelve-day program schedule is printed as a flier, and in Friday's Enterprise. Click here to access our Member Portal.